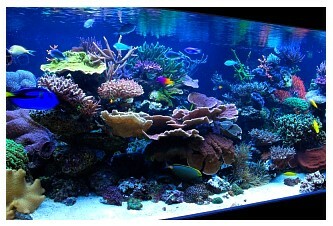 We all strive to create what we believe is the very best looking tank possible. 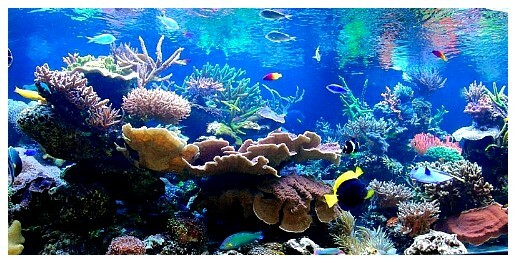 When the editors of Reefkeeping Magazine select your tank as their choice for the Tank of the Month, you can truly say you are being included among the very best marine aquarists in the world. 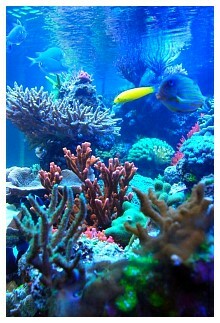 I must say I was very surprised and honored when my tank was selected as this month’s Tank of the Month. I must also say that, although my name is at the top of this article, many, many people have contributed to this system’s development, beginning with its design on paper to what you see today. 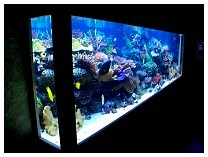 Without the ongoing support of my wife, Lynn, I never would have bought my dream tank. Without the constant help of Tim VanWagoner (TimV), I would still be working on it and puzzling out some of its intricacies. I would also like to thank all the other members of Central Oklahoma Marine Aquarium Society (COMAS) who have been so very helpful when it came to moving the tank/stand and other equipment. I dedicate this article to you all. 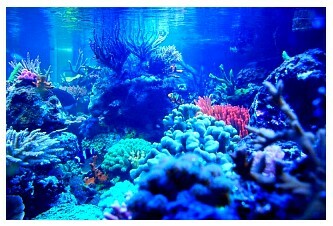 Toward the end of 2005 I began to realize that my 225-gallon tank was rapidly becoming overgrown and that something had to be done. It was then that I began to map out the design of my new tank. 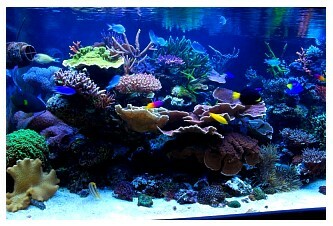 I figured that a tank 8’ long would allow plenty of space for my tangs to swim. 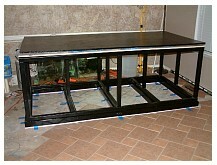 Additionally, I liked the height of my 225-gallon tank, so kept it at 30”. 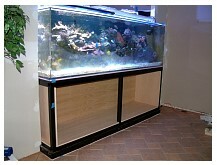 After measuring the space in what was then my dining room, I decided that a 36” deep tank would allow sufficient space behind it to access the electrical and plumbing systems. To hide the overflows, I decided on a black back panel with external overflow boxes. 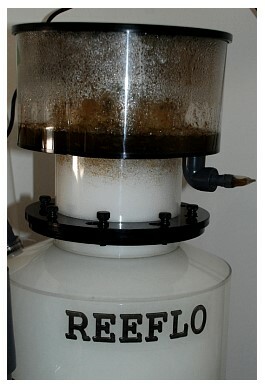 That was the plan initially, at least until I went to order the tank from one of the local stores in Oklahoma City. While at the store I decided that a 48” depth would be really nice, and that I didn't really mind the small sacrifice of squeezing behind the tank a little in order to gain an extra foot of depth. 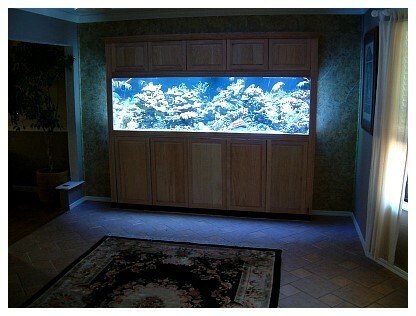 I was, however, completely shocked at the tank’s actual size on the day it arrived at my house (96" long x 48" deep x 30" high). Fortunately, my wife took one look, pronounced that it was going to look “really nice” once it was established, and my initial shock changed to eager anticipation. With the tank in hand I was able to get exact measurements and begin designing the stand, which is made of 2” square 14-gauge steel and is black powder-coated. 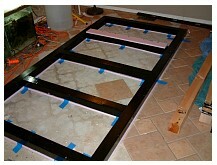 To overcome small height variances in the concrete floor, a wooden subframe was constructed using 4 x 4s. This was built and leveled to the highest point on the floor and the floor’s contour was marked onto the wood. The subframe was disassembled, the wood cut to the marked line and rebuilt to make a bottom edge that completely matched the floor’s contours. Located between the subframe and the concrete floor is a strip of ½” pink insulation foam to further level minor inconsistencies. On top of the stand lies a sheet of ¾” foam insulation and on top of that the tank sits on a sheet of ¾” plywood. Once the stand was complete, four holes were cut into the plywood top to allow the closed-loop system's pipes to come up into the tank. Because I planned on a cabinet under the tank that extended backward for half its depth, the holes were placed in the back half of the stand. 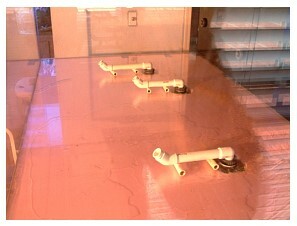 After the tank was positioned on the stand, four holes were cut into the acrylic to fit the 1” bulkheads. 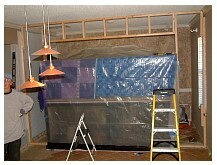 I chose to use heavy-duty grey bulkheads because they are easy to work with. 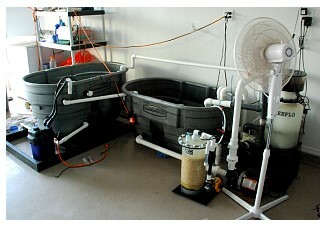 The pump I selected for the closed loop is a Sequence 4200 external pump which has a 2” intake and a 1.5” return. To accommodate the pump feed, the tank was drilled on the back and two 1 ½” bulkheads were fitted. Because I planned to create an aquascape with a canyon in the middle, the bulkheads were situated off center approximately 8” from the top of the tank. Four additional holes were drilled for 1” returns across the back of the tank approximately 8” above the sand bed to give a total of eight returns. These, and the holes in the tank’s bottom, were plumbed to an Oceans Motions 4-way unit by first linking two holes together and then teeing these back to the Oceans Motion’s outlets. 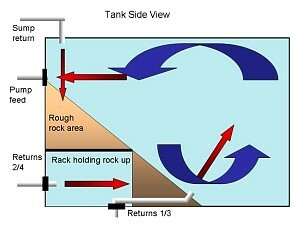 On the inside of the tank, the returns at the bottom were directed across and under the sand layer and then upward at an angle using a 45° fitting. They were designed to come up from the sand bed at approximately the border of the live rock, and thus be hidden by it. The returns at the base of the tank back remained completely open and were positioned to force water behind the PVC racks and then out through the live rock. This setup has worked extremely well, though it may have caused a few of my Montipora capricornis to grow in an unusual manner. 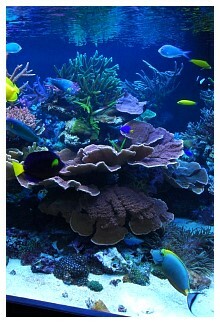 Instead of scrolling upward, the ones located over a water return have actually curled downward over the water’s flow. 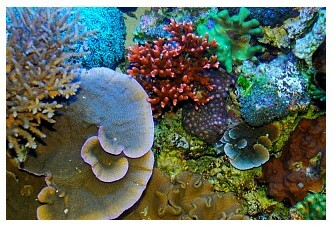 The same corals not subjected to this flow have continued to grow upward normally. Additional water flow in the tank is provided by four Tunze and two Rio Seio pumps. The Tunze 6201 and 6101 are connected to a Tunze controller, and the others are non-controllable units. Together with the return pump from the sump, I estimate the flow rate to be approximately 20,000 gph, which equates to around 30-35 tank turnovers per hour. The tank’s design incorporates two external overflows, each of which was drilled to accommodate two 1.5” bulkheads. 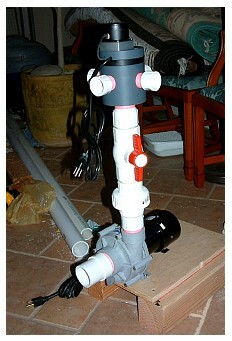 Each of the overflows contains a single Durso standpipe, and the other bulkhead holds an open-ended pipe that sits above the Durso. 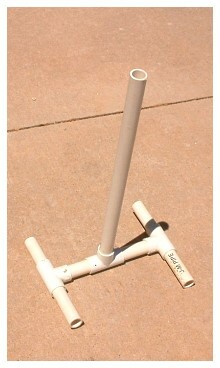 This secondary pipe acts as a safeguard in the event the first pipe becomes blocked or clogged, and thus prevents an accidental spill; both overflows feed to the sump. 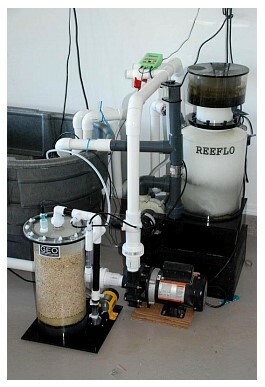 One of the overflows enters the sump directly and the other feeds into the Reeflo Orca skimmer, and then to the sump. This latter piece of equipment is new and was purchased to replace my older ASM G6 unit. 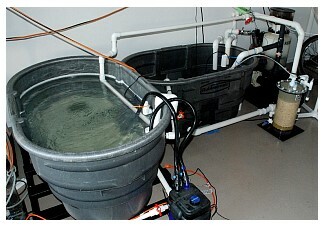 Although the ASM G6 worked well, it added a great deal of heat to the water due to its three submerged Sedra 9000 pumps. The Orca uses a modified Reeflo Dart needlewheel pump as a recirculating pump and has proven to be an awesome addition to the system. 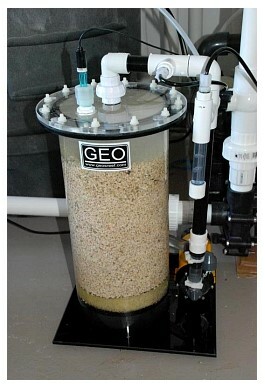 Also feeding into the sump is a Geo 818 calcium reactor, which is controlled by a Milwaukee SM122 pH controller. The tank’s main return is driven by a Reeflo Barracuda pump and passes through a JBJ Arctica ½ HP chiller before feeding back into the tank. 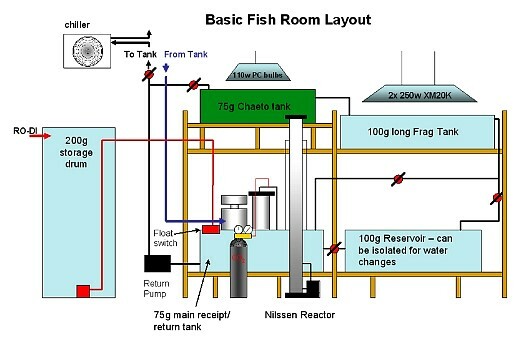 The equipment room, which contains the skimmer, reactor and sump, also houses a 100-gallon refugium containing 8” of aragonite sand. 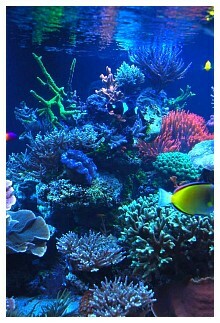 The refugium is fed from a Barracuda pump via a spray bar, thereby allowing the macroalgae growing in it to tumble under the lights, promoting their growth and preventing dead spots. 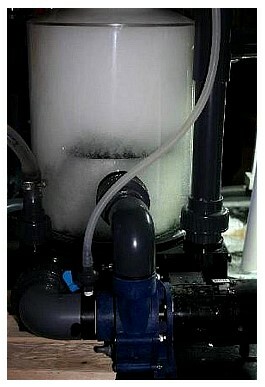 The refugium overflows through a 1.5” bulkhead to the main sump. Other than the calcium reactor, I do not use any supplements in this tank besides the nutrients provided from the fish food. The lighting over the tank consists solely of T5 HO bulbs. At the front of the tank are two 4’ long, eight-bulb TEK hoods; and across the back are two 4’ long six-bulb hoods, for a total of 28 54-watt bulbs, or approximately 1,500 watts. I really like the Giesemann bulbs and, for the most part, there is a 3-to-1 ratio of actinic blue to 11,000K whites. 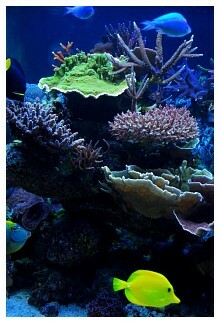 Through trial and error, I have found that this combination best enhances both the tank’s and the corals' color. The lights turn on in a staggered formation over 30 minutes and remain on from approximately noon until 10 pm. 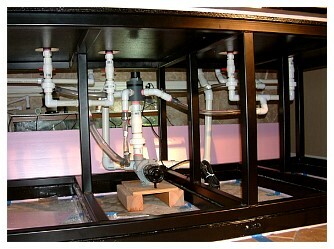 Once all the equipment was installed and the tank was running, a curtain wall was built around the tank. This wall touches the tank’s sides but has an opening above the tank for easy access. 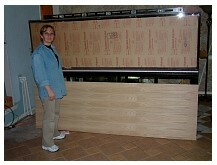 The stand’s sides were framed with oak cabinetry with a matching hood. I have yet to finish the cabinetry and stain the woodwork, but plan to do so shortly. 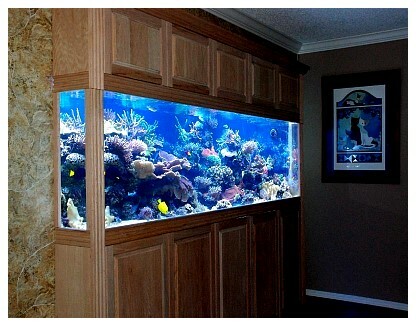 The ultimate effect of all this is to have an in-wall tank with 8” projecting into the room. 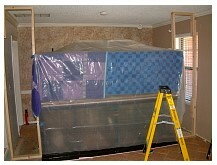 This allows me to have a hood and cabinetry that I can easily access from the front. 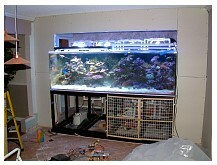 Around May of 2006, once the tank was set up and the plumbing was done, I began the aquascaping project. I had a rough idea in my head of how I wanted the finished tank to look. Having 4’ of depth gave me plenty of space to work with and allowed for a large sand bed area. 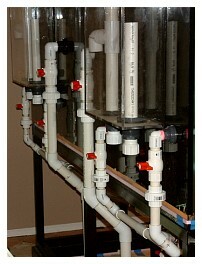 Around the tank’s back I installed two racks of PVC piping and eggcrate (photo below). 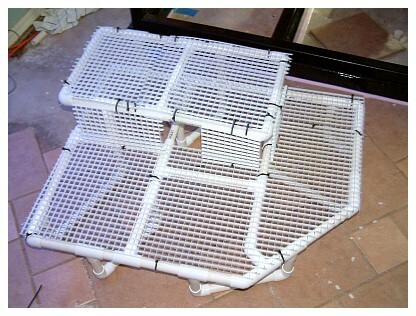 Each rack is “L” shaped, approximately 10” tall, 10” deep and 36” long. 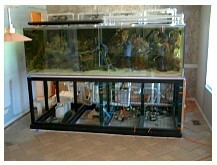 The racks fit into the tank’s corners, leaving a wide gap in the middle as a central canyon. 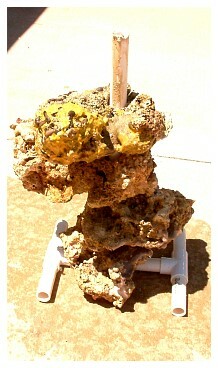 Some larger pieces of live rock that I had collected over the previous year were placed onto these racks. 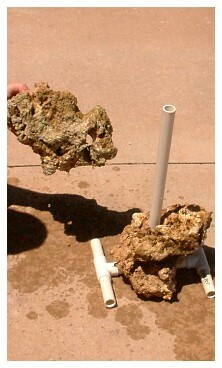 In front of the racks, I loosely stacked smaller rocks to hide the PVC. My envisioned plan for this tank was a highly sculptured look allowing the fish to move in front of, behind and through the rock’s structure. To facilitate this, I built four pillars of rock (shown below) that were made by drilling flat pieces of live rock and stacking them onto a PVC rod held upright by supports on the tank’s bottom. Together with the returns from the closed-loop, which also ran along the bottom, these made a solid base for stacking rock. The base rock of each pillar was carefully selected for its size and shape, (i.e., large and flat), and was positioned at the edge of the closed-loop’s returns. The rest of the pillar was built to provide ledges and unusual shapes in order to focus attention away from the background of loosely stacked live rock. The pillars were also staggered back and forth in the tank in an attempt to remove unnatural aspects of symmetry. The pillars were designed to create a number of nooks to push coral frags into, while still allowing a place for some of my larger corals from my old 225-gallon tank. I believe this combination of pillars, with a central canyon and its rough background, gives the tank a very natural look. 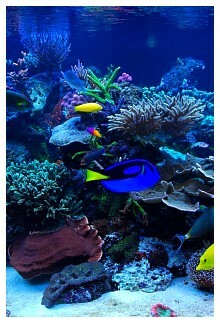 As may be gleaned from the list below, my passion for fish lies primarily with two families: tangs and wrasses. I think this attraction stems from their distinctive swimming pattern. 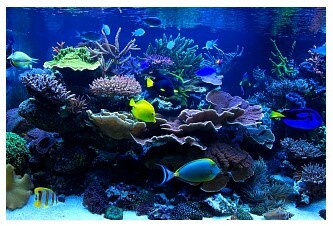 This tank contains six tangs and eight wrasses; my favorite, and most recently added, is the Naso tang (Naso literatus). He’s a blonde variety - kindly passed to me from a friend once he had outgrown his former home. 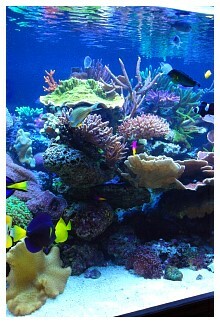 The Yellow, Purple, Regal and Powder Brown tangs were all transferred from my older tank. Of all the wrasses I have, my favorites are the Yellow "Coris" (Halichoeres chrysus). 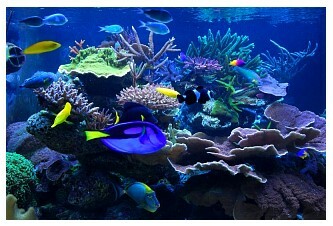 These are extremely graceful fish that seem to move with no energy expenditure. 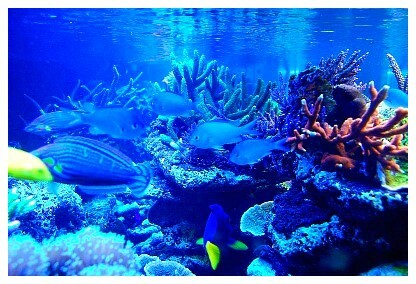 All of the wrasses in this tank were chosen for both their pest eradication and control abilities. Because I like clams, the yellow wrasses are there to keep potential pyramidellid snails at bay. The Melanurus wrasses are there as a first line of defense against the potential introduction of any Acropora-eating flatworms, and the six- and four-line wrasses provide protection against red flatworms. Although primarily selected for their protective traits, these fish are stunning to watch as they glide around and through the rockwork. Interestingly, I have observed both the yellow pairs spawning and, more unusually, the Six-line and Four-line have also spawned, usually as the lights begin to go out at night. Both males chase the female through the rockwork and roll around her before following her to the tank’s surface. As they hit the water’s surface they come together and the eggs/sperm are released, much to the joy of the rest of the tank’s inhabitants. I have observed this several times with the yellows, but far more frequently with the Six- and Four-line pairs, which seem to spawn every three weeks or so. The rest of the fish comprise eight Green chromis, which school very nicely; mated pairs of Amphiprion percula, hosting in the Rose bubbletipped anemones; and black Amphiprion ocellaris hosting in a large Sebae anemone. Although both of these pairs appear to have made nests, I have yet to see them lay any eggs. The largest, and most unusual, fish I have in this system is a pink-tailed triggerfish that regularly cruises the tank surveying all he owns. There are no longer any crabs or snails in this system (though there are many shells...), but there are two mated coral-banded shrimp, a fire shrimp, a sand cucumber, a very large red serpent star and two fighting conchs. 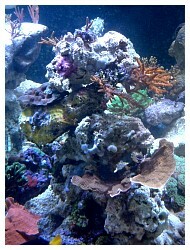 This tank has a mix of corals but predominantly houses small-polyped stony corals. I really like the large structures formed by scrolling Montipora, and these species cover the majority of the tank’s bottom level. 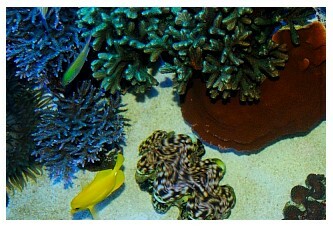 I have five different varieties as well as other encrusting types of Montipora. The fastest growing of all is a blue-polyped purple-bodied type. 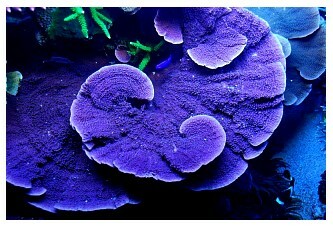 This monster is rapidly taking over a section of the tank and is now over 12” across! 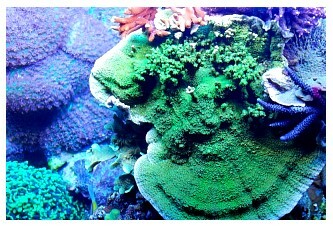 Where it has contacted a green scrolling Montipora, they have fused together to make a very interesting structure. 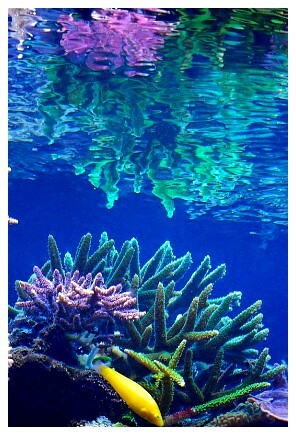 The majority of the pillars’ upper portions are composed of Acropora, branching Montipora, Stylophora and Pocillopora species. 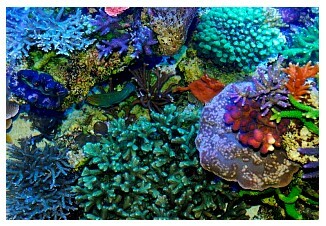 As best as I could, I have tried to match the growth pattern of individual corals to their placement in the reef. 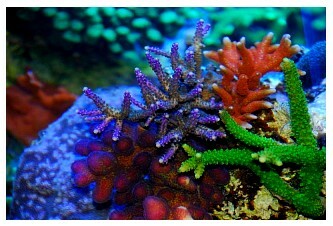 For example, the two tabling Acropora sp. are placed such that they grow out of the pillars; and the more upright Acropora, such as A. valida and the staghorns, are placed on ledges or the pillar’s tops. 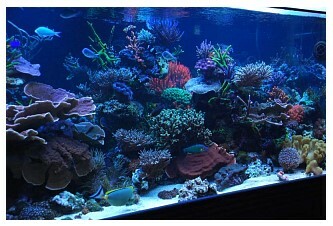 I have a few SPS which reside at the bottom of the tank in various recesses in the rockwork. Numerous zoanthid and mushroom species are also placed around the pillar’s bases. The tank you see is 17 months old. I have already seen huge growth in many corals, to the point where I almost regret adding four pillars in such close proximity to each other. I constantly tinker with my tank, and one project I have in the near future is to reduce the height of the pillar with the green staghorn on the top to open the back of the tank a little more. At least that’s my current plan... I chose acrylic for its lightweight properties but, in hindsight, I wish that I had opted for glass. Acrylic is wonderfully clear, but I am just not careful enough to avoid scratching it. 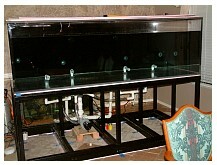 Ultimately, I suspect I will strip this tank and re-do it with Starphire glass, at least that’s another plan. I would like to someday replace the Green chromis with Anthias... and that, like all other plans I make, is subject to change at a moment’s notice. As I said at the very beginning, this tank is a testament to the friendship of all the people on Reef Central, and to the help I have received from the members of COMAS. I hope that this write-up has given you some insight into the design and build of a large system.